After having helped master Su move from Taipei to Spain, Sept. 2016, I thought it time to pay him a visit again, this past Easter. Now that he is living in Europe, one should think it would be easier to visit, but in fact it is a longer trip than traveling to Taiwan, due to the bad flight connection between the airport of Kristiansand and La Palma. 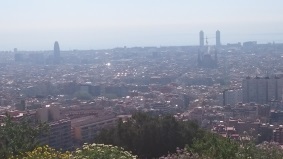 Having to spend at least one night, I decided to travel through Barcelona, and take advatage of the situation and visit Guillermo and his school as well. 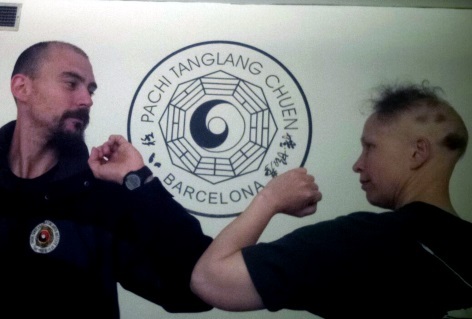 Once in La Palma the days passed fast, as they always do when in the company of master Su. Although the daily rutine is a lot more calm, now that he has finally retired for the hassel of traveling around the world teaching the countless students he has. I remember at one time when I was traveling with him we made 11 international trips in one year, as well as participate in at least two major competitions in the US, visit the school of his elder students in the US and teach in the school of NY. His retirement is long over due. During my stay in La Palma, I was also accopanied by two fellow students and their daughter, from Mallorca. The days went by by long meals, walks in the center of La Palma, and plesant talks about martial arts, past experiences and future endeavors. - In Chinese culture, a master is refered to with the metaphor of a candle. A candle that burns it's self, inorder to light up others. This is the life master Su, Yu-Chang has led. All who have studied under him know this, he is a pure "dragon of fire", when it comes to teaching, speaking and acting. This candle, has been burning since the age of 6, when he started his journey within the martial arts. Since a young age he dominated his art, and since a young age he dedicated himself to teaching. He preaches lots, but does little for himself; this we know. Because he is the candle, he came to this world to be a a teacher, a guide, he is the tourch who shows the students the way to the light, eventhough he himself gets burned. Today as a student I want to express this. All who are close to him know that one day will come when the candle will burn no more, just like al material of this world. Not though, his spirit, that spirit of teachings which has left countless students around the world, without frontier. The spirit which can not be described, only felt; but at the same time will last forever in this world.